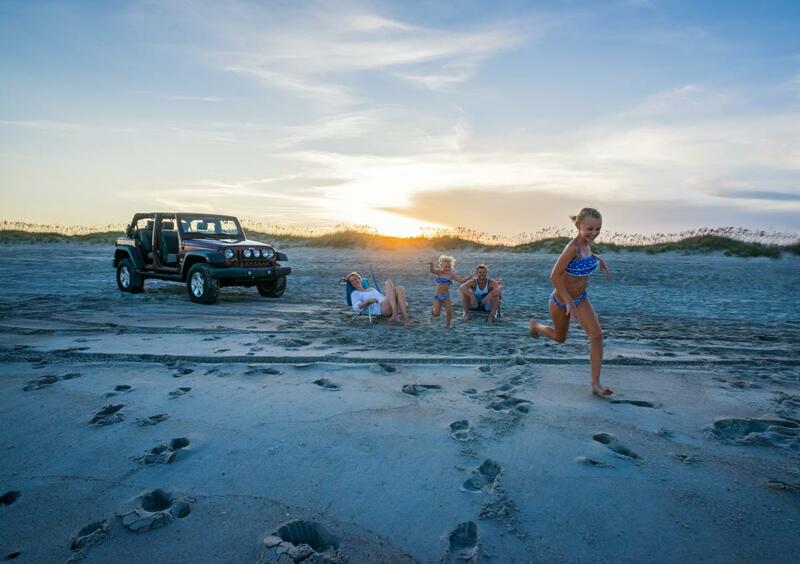 Kure Beach offers a naturally beautiful setting, miles of undeveloped beach and signature state attractions. Here is just a sampling of the top things to do in this perfect seaside retreat. Click or scroll them all. Experience nearly six miles of pristine beach, trails and salt marsh brimming with wildlife. The 288-acres of Fort Fisher State Recreation Area encompass both the Atlantic Ocean and Cape Fear River. Take a four-wheel cruise along the beach with required permit and escape to your own private stretch of sand and shore or cast a line and partake in popular surf fishing. Attracting both photographers and bird watchers, this protected shoreline is home to nesting loggerhead turtles, piping plovers and other rare species. Meander along the trails, soak in the sunshine, or cruise to find your own secluded spot. 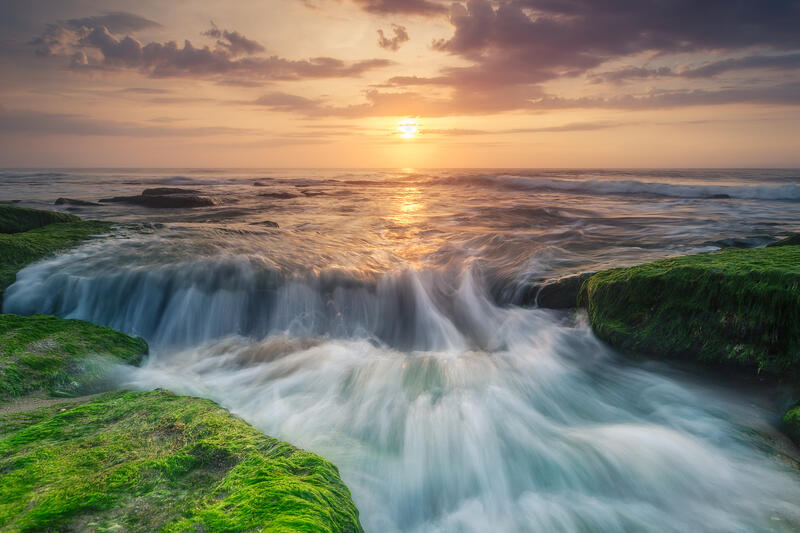 Located at the southern top of Kure Beach, Fort Fisher is home to two of North Carolina’s landmark attractions, the North Carolina Aquarium at Fort Fisher – named as one of the Best Aquariums in the U.S. by the Travel Channel – and the Fort Fisher State Historic Site and Museum. The North Carolina Aquarium at Fort Fisher has more than 2,500 animal residents and provides an interactive experience for guests with touch tanks, daily live animal presentations, feedings and more. Take a journey down the Cape Fear River to the coastal waters. Begin an Aquarium adventure along winding garden walkways experiencing waterfalls, bays and swamps. Explore marine environments from salt marshes and tidal pools to a two-story open ocean exhibit featuring sharks, rays and eels. Expect close encounters with wildlife along the way! Watch live feedings on an Extended Behind the Scenes tour. Visit the top of the aquarium’s largest exhibit, the Cape Fear Shoals, and get a bird&apos;s eye view of this 230,000 gallon tank as sharks, a sea turtle, moray eels and other fish swim below. Aquarists feed the animals during the tour, offering a unique opportunity for close-up viewing. Come face-to-face with a loggerhead sea turtle. 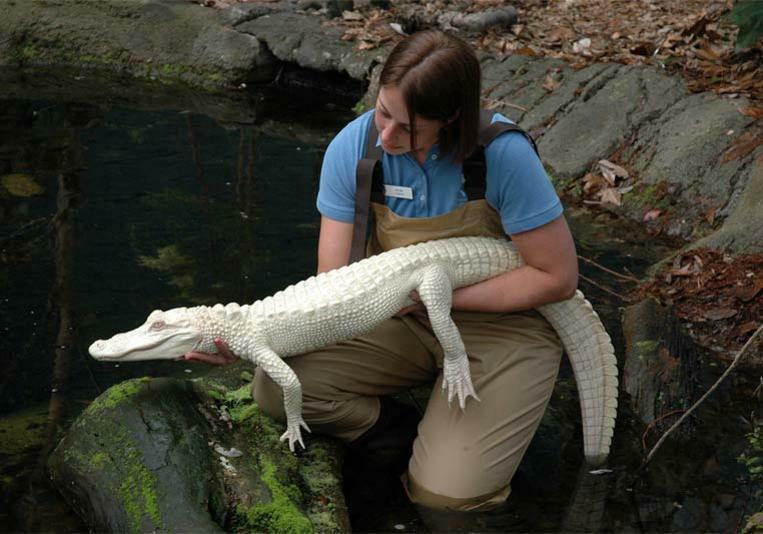 Meet Luna, a rare albino alligator. Talk with divers swimming among sharks, eels and meet Maverick, a rescued bald eagle. Climb and play on Adventure Reef. The play area features unique components – springy climbing cables, spinning bars, wobble pods – to flex children’s mental and physical muscles. In addition to the play structure, families can explore together to find fossilized shark teeth and other treasures in Shark Tooth Creek, a dig area shaped like a spiraling nautilus shell. Touch sea stars, horseshoe crabs and even a live baby shark in the aquarium’s touch tank! Located at the south end of Kure Beach in Fort Fisher, the Fort Fisher State Historic Site was a Confederate fort and site of the largest land-sea battle of the Civil War. The Confederate fort protected the vital trading routes of the port of Wilmington and approximately ten percent of the fort still stands today. Walk the quarter-mile trail that encircles the remains of the fort on the river side of the highway and see a restored gun emplacement located on top on one of the batteries. Annual events include historical reenactments, artillery demonstrations with the firing of the site’s 32-pound banded and rifled cannon, and the Holiday Open House featuring seasonal refreshments and period music and decorations. Unplug among natural wonders during an eco-adventure at Kure Beach. The Fort Fisher State Recreation Area is known for its six-mile stretch of undeveloped beach where visitors can enjoy swimming, sun bathing, fishing, shelling and birding. Fort Fisher is home to 16 threatened and endangered species at different times of the year, including Loggerhead sea turtles in the warmer months and hawks, warblers and peregrine falcons in the fall. Visitors also flock to the area in the fall as the Loggerhead sea turtle nests scattered along the shoreline began to hatch. This threatened species is protected by the Endangered Species Act. Each summer local citizens, such as the volunteers for the Pleasure Island Sea Turtle Project, work day and night to help hatchlings return to the ocean. The North Carolina Aquarium at Fort Fisher in Kure Beach is an excellent place to see a live baby sea turtle in its first year of its life. Each year, the aquarium nurtures a handful of hatchlings that have been rescued from doomed nests and then releases them the following year. The aquarium also studies Loggerhead migration patterns. Walk out on the north side of the recreation area beach at low tide and discover the beautiful coquina rock formation. This rare rocky outcropping is cemented together by seashells and coral and dates as far back as 80,000 years ago. Visit nearby Zeke’s Island by small boat, canoe or kayak. Three islands comprise this component of the NC National Estuarine Research Reserve with extensive marshes and tidal flats. Inhabitants include shorebirds, mammals and endangered loggerhead sea turtles. 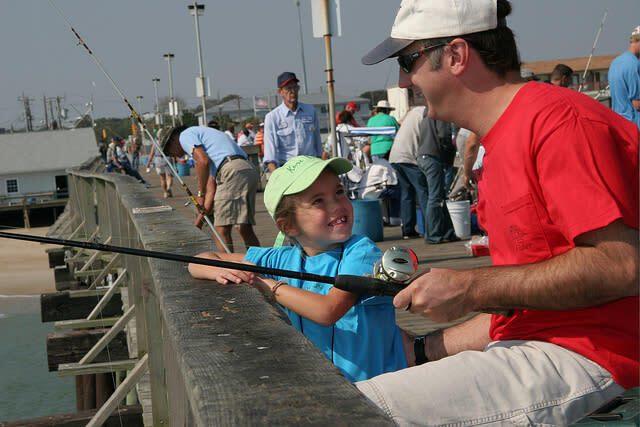 Whether you’re a fan of pier fishing, surf fishing or offshore fishing, the waters surrounding Kure Beach are home to some of the best fishing in North Carolina, including deep-sea fishing charters available nearby on the island at the Carolina Beach Fishing Center and Marina. For those anglers looking for some competition, Kure Beach hosts numerous tournaments throughout the year like the annual Pleasure Island Surf Fishing Challenge in October. Or grab your lucky fishing pole and head to the 712-foot Kure Beach Fishing Pier, one of the oldest on the Atlantic Coast. See the shore from a breathtaking perspective and kayak the coastline or hop aboard the ferry for a scenic trip to the mainland. Visitors are drawn to this small wonder with the opportunity to dive in waters where a host of historic shipwrecks can be explored and fascinating prehistoric fossils can be found on the ocean’s natural ledges. You can find the North Carolina Underwater Archaeology Branch (UAB) located at the Fort Fisher State Historic Site. The UAB projects and exhibits range from the prehistoric to the present, maintaining extensive records on everything from wooden dugout canoes to iron-hulled blockade runners and classic steamboats. In all, the UAB keeps track of more than 5,000 documented shipwrecks. Civil War blockade runner The Condor was recently dedicated as North Carolina’s first heritage dive site. The steamer ran aground in 1864 with famous Confederate spy Rose Greenhow on board. The Condor now rests in 25 feet of water, 700 yards off the shore in front of the North Carolina Aquarium at Fort Fisher, where buoys mark the site along with mooring lines for boats and kayaks. Dive enthusiasts are encouraged to explore The Condor June through November each year. In addition to The Condor, Kure Beach is home to hundreds of fascinating dive sites, including historic shipwrecks and ocean ledges that house prehistoric fossils. 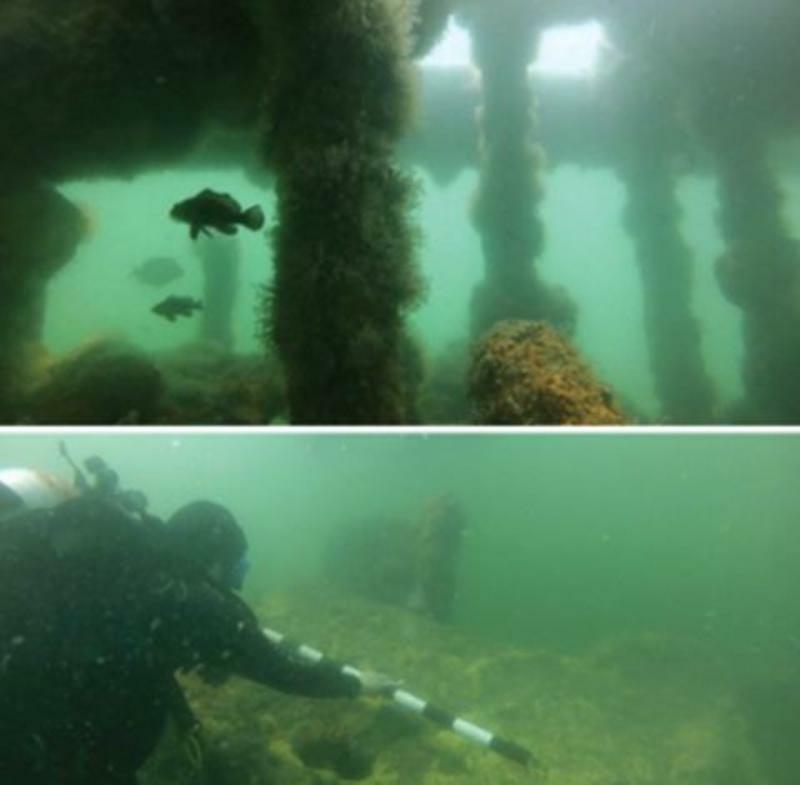 Visitors can dive at the same site dozens of times and still walk away from each dive with a unique underwater experience that features aquatic life, historic artifacts and much more. Find diving charters here to take you on an underwater adventure of a lifetime. Known as a prime beach destination for young families in the summer, young professionals to empty nesters find fall is a perfect time to book a beach getaway here. With kids back in school, visitors traveling without kids can enjoy less crowds, mild temperatures and more affordable lodging rates in the off-season. Less crowds also means less waiting at island restaurants and bars, and even more space to spread out and relax on the beach. Travelers can experience nightlife like a true local by visiting island favorites nearby in Carolina Beach such as the Fat Pelican. Groove to the tunes from local and regional bands at The Ocean Grill & Tiki Bar and Seawitch Café & Tiki Bar, which feature a lineup of live entertainment well into the fall. 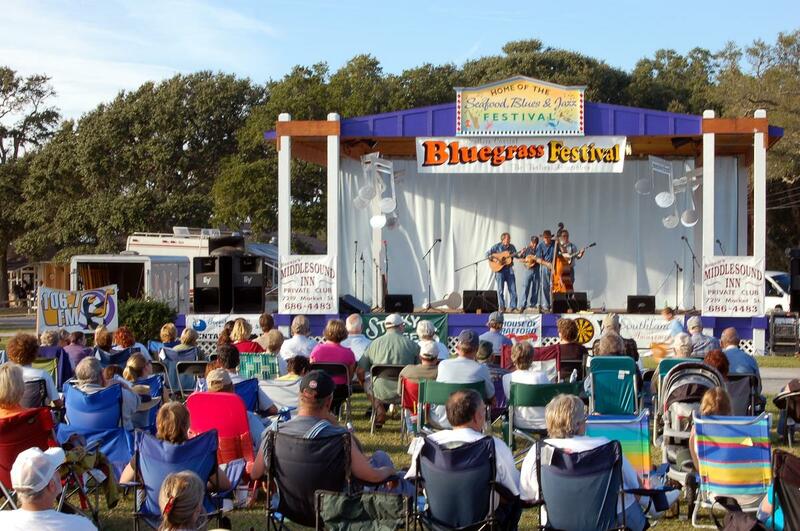 Another top activity among travelers includes a fall seafood and music festival. If jazz, blues and some of the best seafood around sound like your idea of a good time, mark your calendar for the Annual Pleasure Island Seafood, Blues & Jazz Festival (October). Who needs Florida when Kure Beach has everything retirees, seniors and baby boomers could ask for? With accessibility, affordability, great weather and a laid-back atmosphere, Kure Beach is an ideal spot for rest and relaxation. 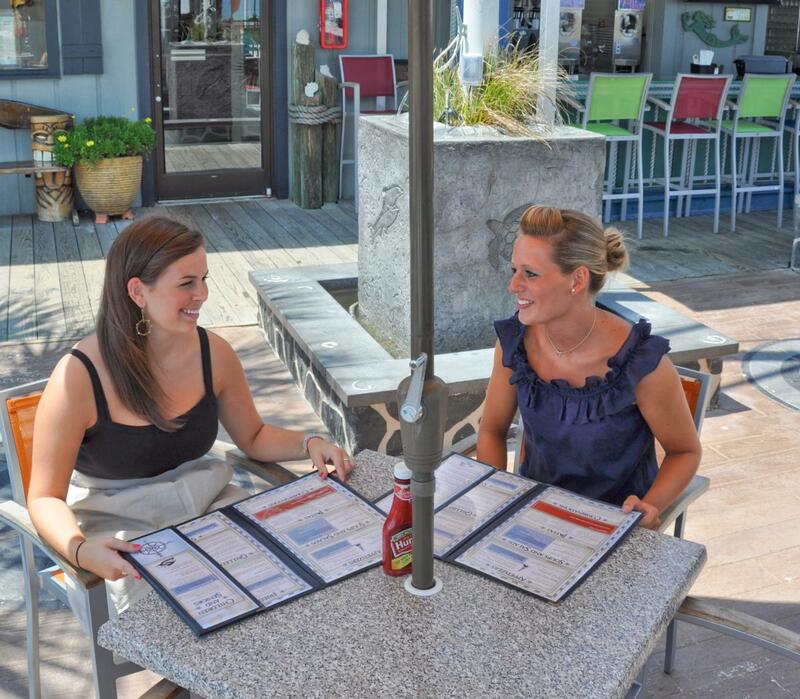 Main attractions, restaurants and shopping are within walking, biking distance or just a short drive away on the island. 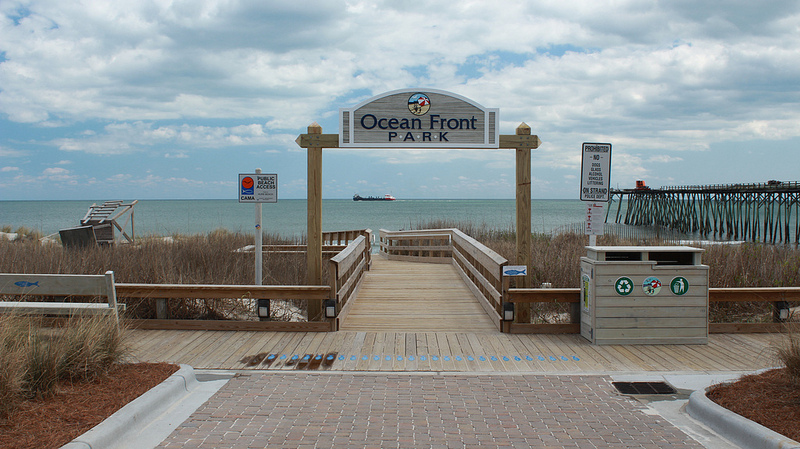 Ocean Front Park is Kure Beach’s largest public green space. 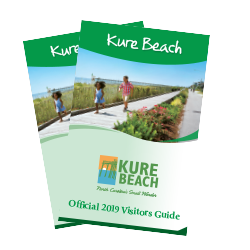 Located in the heart of Kure Beach’s quaint business district near the town’s iconic fishing pier, the park features a boardwalk, a playground for small children, rain gardens, oceanfront swings and public restrooms. One of the biggest attractions at the park is an open-air pavilion with a stage area to be used for concerts, weddings and educational events. Find family-friendly events during the summer season such as Story Time with the mermaid princess and her fairytale friends or Boogie in the Park on Sunday evenings. Bring your beach chair or blanket and enjoy free, live entertainment by the sea! Don’t miss Kure Beach’s annual events, which include: the Street Festival featuring arts and crafts, food and more (April); the Carolina Beach Music Festival, the largest and only music festival held on the beach along the North Carolina coast (June); the Boardwalk Film and Fireworks Series on the island in nearby Carolina Beach (June through August); the Pleasure Island Seafood, Blues and Jazz Festival featuring nationally recognized artists (October); little ghouls and goblins can Trick or Treat Under the Sea at the North Carolina Aquarium at Fort Fisher (October); and the Cape Fear Kite Festival (November). 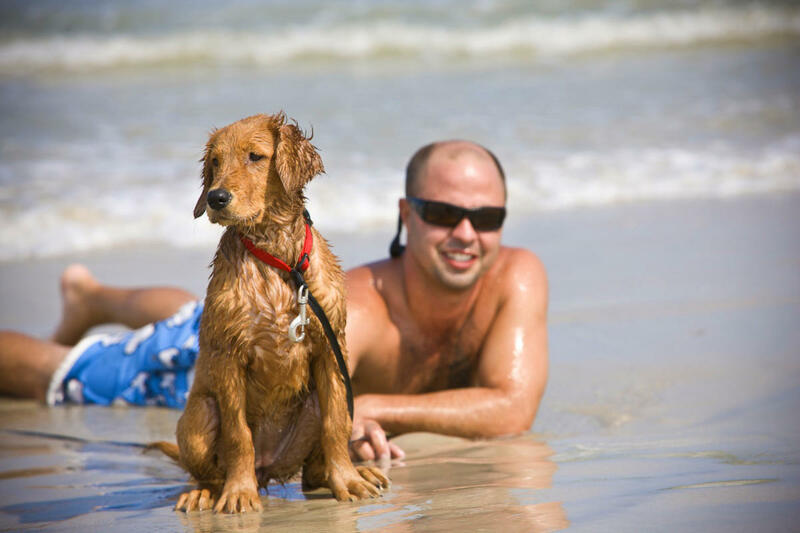 Bring Fido along on your next trip to Kure Beach. Dogs are allowed on-leash on the beach strand from October 1 through March 31. Fort Fisher State Recreation Area welcomes dogs year-round. Pets are welcome at the Annual Salty Paws Festival held each October, where you can learn more about animal adoption and check out vendors while enjoying games. See where an elusive and infamous hermit lived. The renowned Fort Fisher State Recreation Area’s hermit (62 year old Robert E. Harrill) lived in an abandoned World War II era bunker near the Cape Fear River along a salt marsh for 17 years, from 1955 until 1972. He became a hermit in 1955 at the age of 62. People heard of and came to visit the “Hermit” to listen to his philosophies and imparted wisdom throughout his stay there and today you can still see the bunker he made into a home on the recreation area’s 1.1-mile trail. 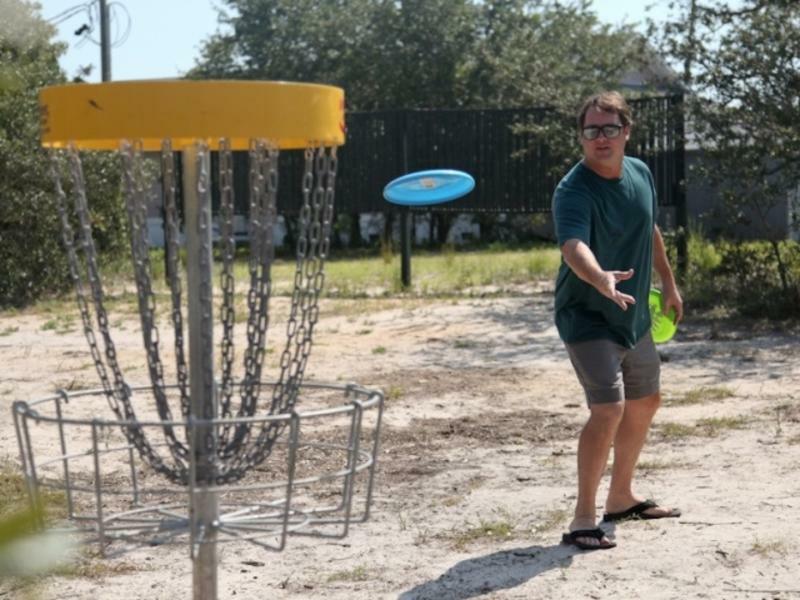 Visit the area’s only Disc Golf Course featuring a unique terrain of sand and oak trees. This course is 18 holes with the longest run at 500 feet, great for seasoned players as well as new ones! Test your skills on the island’s only Skate Park, an 8,000 square-foot-park featuring ramps, twists and turns for all levels. Enjoy a holiday season that’s a little less hectic at Kure Beach. 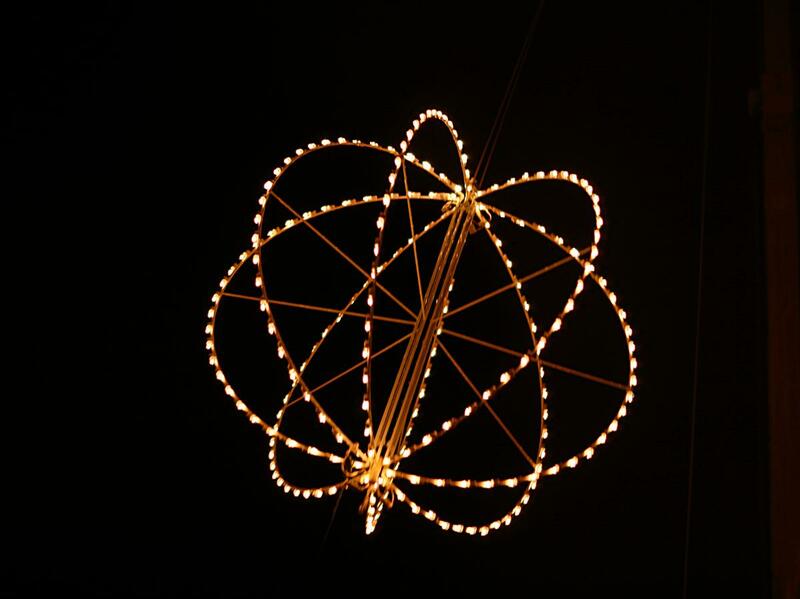 The centerpiece of the holiday season is the Island of Lights Festival. The festivities kick off the day after Thanksgiving with the Light Up The Lake ceremony and culminate with the New Year’s Eve Countdown. Enjoy the closest shopping to the Atlantic Ocean at the Kure Beach Holiday Market featuring handcrafted items from more than 30 artists. 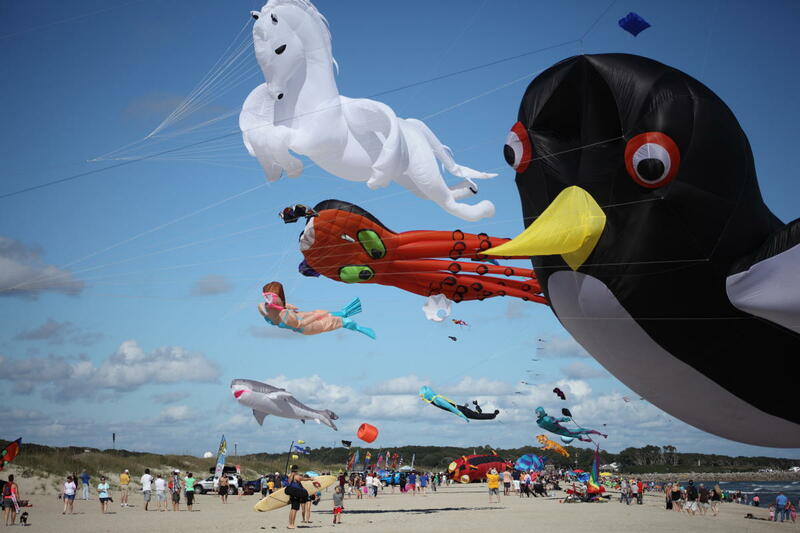 Other events include a tradition found only on the coast, the Holiday Flotilla held on the Intracoastal Waterway with a parade of decorated boats.